I really had to pat myself on the back here because the trip was great from every angle. 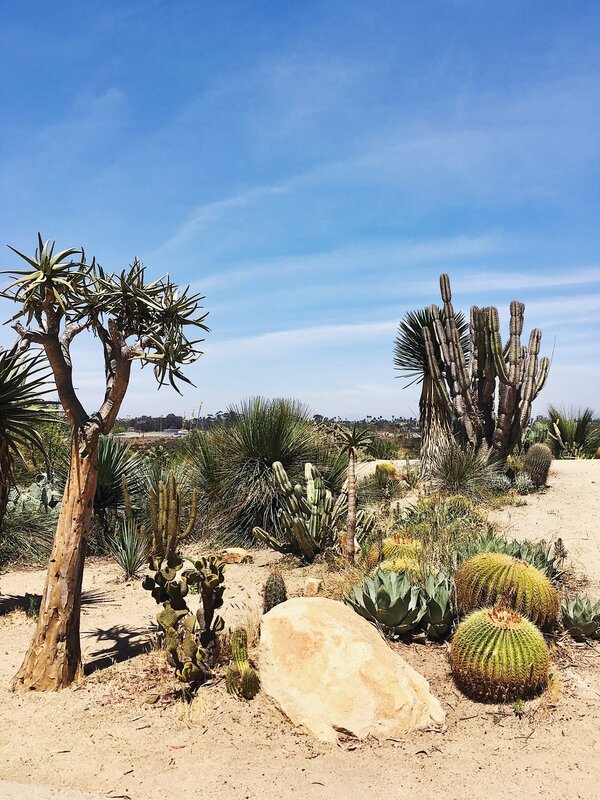 Keep reading for my San Diego city guide which will cover where to eat, what to do, and where to stay! Rare Form & Fairweather: I can’t comment on the rooftop patio that supposedly makes a mean drink (THEY PUT FLOWERS IN THEM!) in a glorious atmosphere, but I did have ahi tuna tacos in the restaurant below and they were delish. Cucina Urbana: Modern Italian in a hip space with very reasonable prices. The tomato sauce and bread tasted just like how my Nonna used to make!! I also had an amazing vegetarian pesto pasta dish that I could eat over and over again. True Food Kitchen: Tons of organic and sustainable offerings are found at this restaurant that is attached to Fashion Valley Shopping Center. An abundance of vegan and vegetarian plates, but also some meat options. There is a large patio with a fire pit, hanging lights, reclaimed wood tables, and plenty of greenery. We had edamame dumplings as a starter, then shared an ancient grain bowl and grilled fish tacos. Everything with super fresh, healthy, and so good. True Food Kitchen is actually a small chain in the US so there are several scattered across Cali, Texas, and a few other states. Juniper & Ivy: I sang praises of this place on Instagram and I will say again: this is the best meal I have had in recent memory. Probably one of the top 10 meals of my life. Such unbelievably innovative and inspired dishes. They combine flavours so creatively and the plating is stunning. It’s definitely on the pricier side, but so worth it. The dishes are quite small and ideal for sharing. We had tuna toro dip with avocado, halibut hand rolls, sockeye salmon with garlic chips, squash agnolotti, snap peas, stone fruit & burrata salad, and a peach pavlova for dessert. Literally every single thing aside from maybe the snap peas was heavenly. Cannot recommend this place enough. 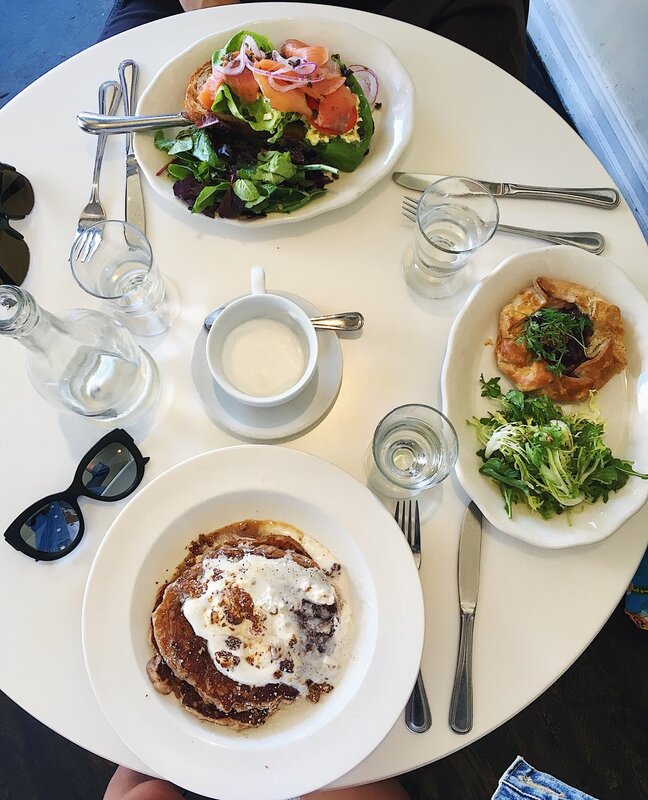 Cafe Gratitude: With a few different locations across California, Cafe Gratitude is basically where you would picture ultra-fit, well-groomed Californians to come grab a juice or quinoa salad. This small chain is quite well-known in these parts and it is entirely vegan. The menu is quite extensive though... my mom and I literally took 40 minutes deciding what we wanted, even after asking the waitress a million questions. They take vegan food and make it SO delicious that you won’t even miss any of the animal byproducts. We had vegan enchiladas and a vegan eggplant parmesan sandwich on a ciabatta bun. They were both outstanding. The San Diego location is also an Instagram dream… a mostly-white interior with macrame wall-hangings, marble surfaces, big leafy plants, and an amazing tiled floor that is ideal for a #fromwhereistand. The Donut Bar: In a stark contrast to the previous vegan recommendation, we literally came across this amazing donut place called the Donut Bar at complete random. It was close to our Airbnb and the first time we walked by they had a sign out front that said they were sold out for the day. My mom was like "LOL, why don't they just make more??"... but then when we walked by a couple days later we peered in and saw DONUT HEAVEN. So we were suckered in. As always, we stood trying to decide what to get for WAY longer than is appropriate or normal. There were too many choices...: hot chocolate, strawberry cream, Homer (like the Simpsons! ), birthday cake, blood orange, and so on and so forth. They even had a vegan chocolate one, but we didn't come to the Donut Bar for our health so we FINALLY decided on a salted caramel latte donut. Hugest and literally the BEST donut I have ever had and probably will ever have. There's a reason why this place has been voted #1 donuts in the US by approximately 635 different media outlets. Herb & Wood: Amazing atmosphere. Industrial feeling, with exposed beam ceilings and brick walls, but balanced by chandeliers, a gilded bar back, and the most inviting patio with a big fireplace and thick marble tables. They have a wood-fired oven and their pizzas are the most noteworthy menu item. I had an amazing bourbon & rosemary cocktail and a truffle & goat cheese pizza. Also tried the seared black cod, roasted baby carrots, whipped eggplant, and seared scallops. Really great spot. Cafe Chloe: To be honest, I wouldn’t rush back here, but it’s a cute French spot with some decent food. We went for brunch and had gluten-free oat flour pancakes with candied walnuts, an onion tart, and cured salmon gravlax. Lionfish: Located in the new Pendry Hotel, this is a dark & swanky high-quality sushi restaurant. It just recently opened so they are still working out some kinks with their service, but the sushi was very good. In-N-Out Burger: LOL, I had to include this one. If you’re like me, you rarely find yourself in one of the 6 southwestern states that currently offer In-N-Out. DAT SECRET SAUCE THO! Honestly, as a very infrequent meat-eater, I don’t have a whole host of other burgers to compare it to, but it was GOOD. I didn’t even attempt to go for a secret menu item and ordered a cheeseburger, one of only 3 burger options on the limited menu (they have a double cheeseburger, a cheeseburger, and a hamburger. The only other food item on the menu is fries.) I went for the experience, but enjoyed the heck out of the cheeseburger. Shoulda just went for it and said “Whatever. I’m getting cheese fries”… and a milkshake too. George’s at the Cove: This is the place to go for dinner in La Jolla. We didn’t get to sit on the rooftop terrace, which offers the most stunning sunset view due to its high point up on the hill overlooking the ocean, but it was cloudy the evening we went anyway. We ate in the restaurant below and the food is really fantastic. It’s been voted San Diego’s best restaurant. I had tuna tacos (the filling and exterior is allll tuna, no carbs here), chilled carrot soup, Baja striped bass, and pineapple mousse. The dishes were all incredible and the plating is, of course, beautiful. Seaport Village: A bit of a hokey tourist area that is better suited for families. I’d skip this next time. Gaslamp District: The Pendry Hotel is in this area, which is a couple of streets full of mostly restaurants and hotels. 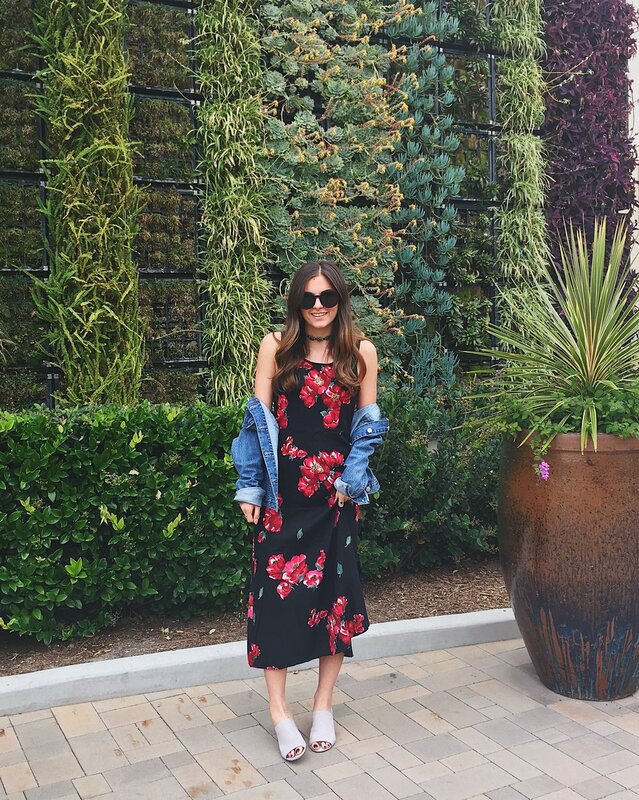 Fashion Valley Mall: A great outdoor shopping center about a 10 minute drive from downtown. You’ll find high-end stores like Prada and Louis Vuitton, department stores Saks and Nordstrom, and fast fashion retailers like Topshop and Forever 21. The Topshop has an amazing selection and I bought a few things because the assortment is slightly different than in Canada. I also went into a Charlotte Russe for the first time in 15 years… thought it was a teeny-bopper store, kinda is, but they have some great (& very affordable) items if you dig. I got a really cute white cold shoulderdress that I’m dying to wear in Greece this summer. The Nordstrom was having a big shoe sale so I got a really great pair of Rebecca Minkoff sandals for $60. And, as we all know, Forever 21 in the US has WAYYYY more stuff (if you can believe that…) than Canadian F21s. Balboa Park: The San Diego Zoo is here. We didn’t go, but the park is a massive piece of land with endless walking trails, museums, gardens, dog parks, cafes, and tiny shops. It’s a really fun place to get lost in for a day. Coronado: Cross over a (VERY HIGH, VERY SCARY) bridge from San Diego and you’ll find yourself in beachy vacationtown, USA. It feels very separated from the mainland and it’s a cute peninsula with tiny beach cottages, lots of shops, patios, and sandy beaches all around. 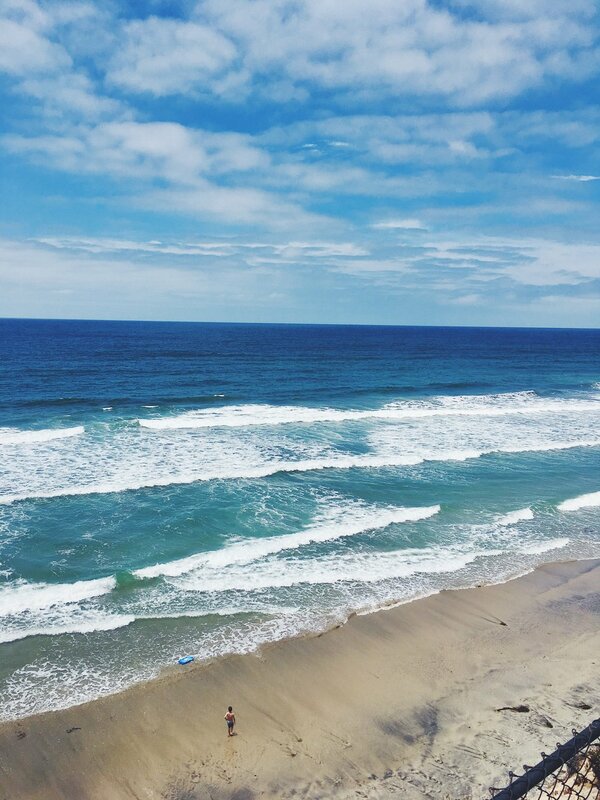 Encinitas: I loved this beach town. It felt so authentic California… almost like you have been transported back to the 70s when surfers and hippies ruled. It’s covered in chic shops and endless cute coffee shops and lunch spots. It has a stretch of glorious beach (Moonlight Beach). If you can find one of the few public staircases down the steep cliff to it, you can walk for miles at low tide and it is not at all crowded. Self-Realization Fellowship Meditation Gardens: This is a gem in Encinitas that I think merits a trip here on it’s own. This is a free garden operated by the Self-Realization Fellowship. You start at the base of a staircase and go through a winding path surrounded by lush tropical plants and several koi fish ponds. There are benches and little paths off the main path for anyone who wants to meditate. It is a really special and calming place to be. Once you get to the cliff, you are in a clearing with a gorgeous unobstructed view of the ocean, surrounded by more tropical plants, flowers, and cacti. La Jolla Cove: The sea lions!!!!! And the sea, and the cliffs, and the parks. 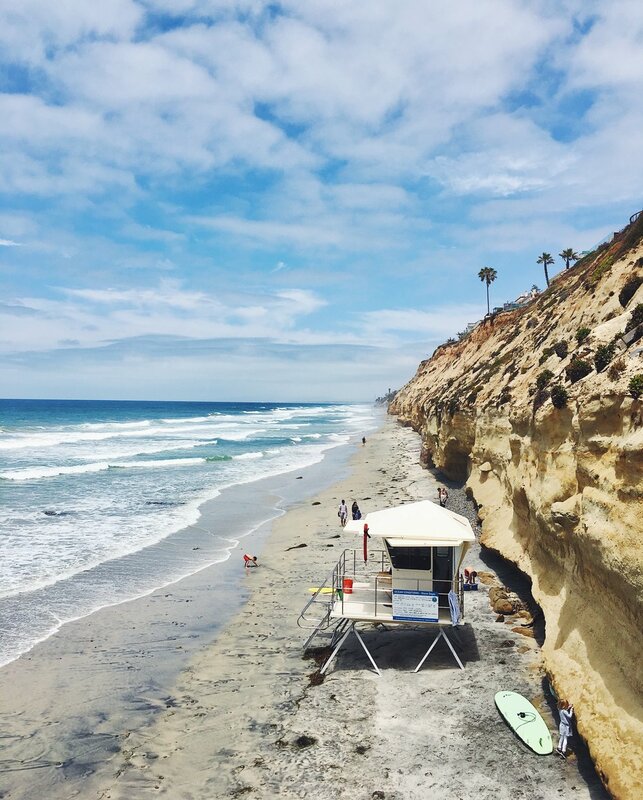 La Jolla is a must-visit. My favourite thing was seeing the sea lions, obviously. They slop themselves out of the ocean and onto the beach/rocks to bask in the sun. There are tons of them and they are so used to the people/maybe too lazy to care. You can get very close to them, but I was happy to see that everyone was maintaining a respectful/safe distance and no one was trying to touch them. They’re so fun to watch and we were lucky enough to see several babies too. WAHHHH SO CUTE!!!! The Pendry: Just opened in February this year, it’s got a really cool downtown vibe and THE most fabulous rooftop pool that I have only seen on Instagram, but I assure you, it looks unreal. My only experience here is eating at the restaurant here, Lionfish, as mentioned above. For downtown San Diego, this is your best bet. Hotel Del Coronado: As mentioned above, Coronado feels worlds away from downtown San Diego. It’s got a real beach town/touristy feel to it, but it’s not a bad way to spend a day. The Hotel Del Coronado was actually where we stayed when I came as a youngster, and its the most recognizable landmark of the area. A traditional old Victorian hotel right on the beach, built in the 1800s, with some pretty beautiful landscaping and tons of history. There is apparently a resident ghost who shot herself in her room there after being abandoned by her lover. Hearing about this was MUCH to my dismay when we stayed there years ago and I was positively terrified of seeing her ghost or having my toothbrush fly off the sink. Thankfully we had no supernatural encounters and I think it’s a lovely place to stay. 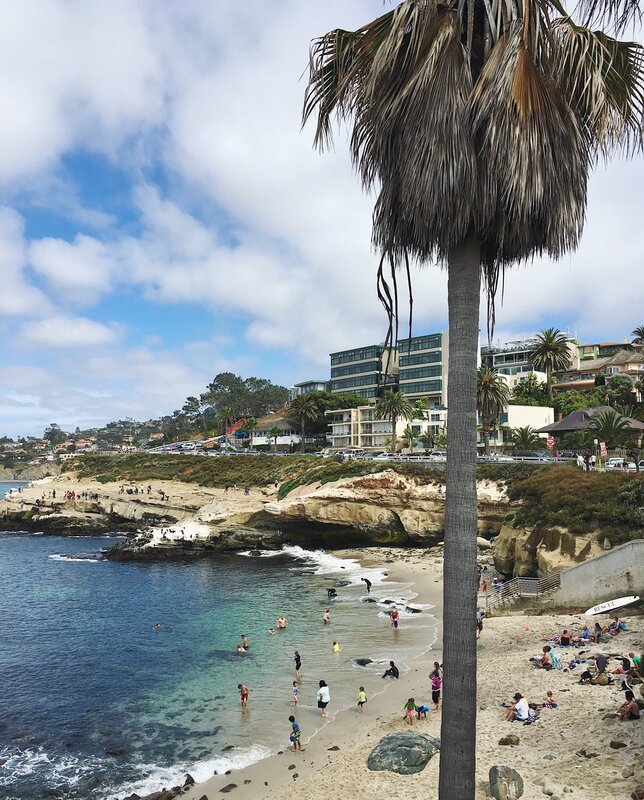 Hotel La Valencia (La Jolla): La Jolla is one of the most idyllic southern California beach towns, as I mentioned earlier. 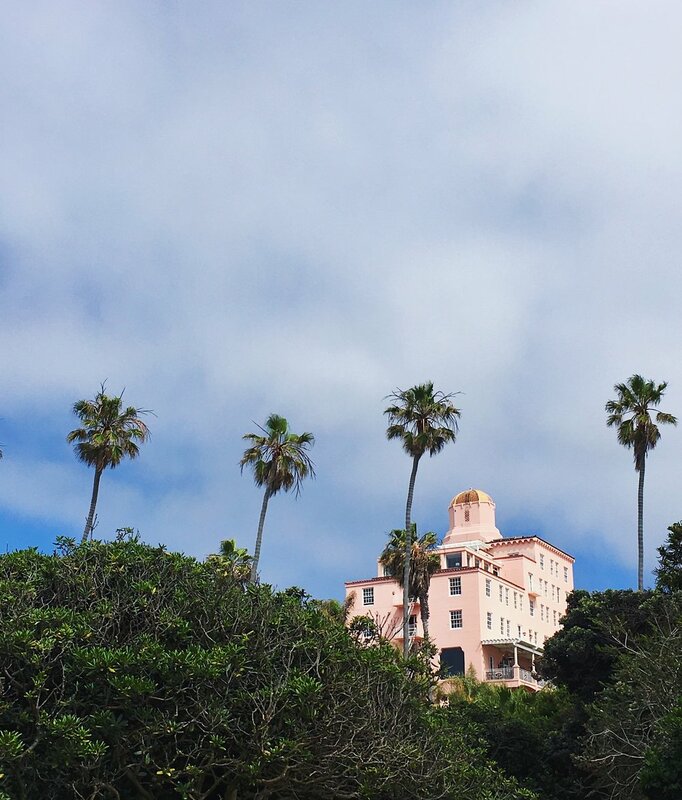 This pink palace sits high on the hill with stunning views of the ocean. It’s right in the centre of La Jolla and provides easy access to all of the shops, sights, and restaurants nearby. It has a beautiful pool and palm trees abound, and literally the entire exterior of the hotel is painted Millennial Pink… and has been since before Millennials even knew what Millennial Pink was.